WILEY H. KEITH was born in 1870 in Texas. He was the son of GREEN WOOD KEITH and SARAH L. BROWN. He married EMILY CATHERINE HOLLIDAY before 1893. She was the daughter of FRANCIS AYRES HOLLIDAY and JENNETTA CATHERINE PAGE. She was born November 1870 in Victoria, Victoria County, TX and died in Hext, Menard County, TX. 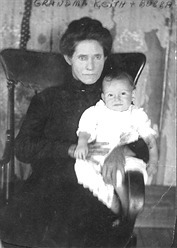 JANNETTA FRANCIS KEITH b. November 1893 in Concho County, TX. ROBERT EARL KEITH b. June 1897 in Concho County, TX.